Mercedes-Benz V-Class Boot Space, Size, Seats | What Car? Access to the front seats is easy thanks to the large door apertures, and the rear seats are even easier to get to thanks to a vast electric sliding door on each side. These are also a real plus point when you need rear-seat access in a tight multi-story car park. There’s a completely flat floor that makes it easy for passengers to move around inside. It is roomy, too, but the standard length V-Class doesn’t actually offer much more space for each passenger than the Ford Galaxy. The second and third row of seats sit on rails that run from front to rear, allowing you to position them to maximise leg room for either of the two rows, or to enlarge the boot space. However, sliding them back and forth isn’t as easy as it is in a regular MPV. The standard arrangement is of two individual seats in the second row with a storage box in between, which contains cup holders and two foldout tables. If you wish, you can turn this row around to face the three third-row seats. Long and Extra Long versions come with eight seats as standard, including three seats in the middle row as well as the third. Disappointingly, the boot area is relatively small and will struggle to take seven people’s luggage. You’ll find the Ford Galaxy to have a far bigger boot with all its seven seats in place, and it also shares with similar regular MPVs the advantage of a third row that folds into the floor when it’s not in use. The V-Class only offers the option of removing the third row altogether, and it’s a cumbersome thing to lug about and store. 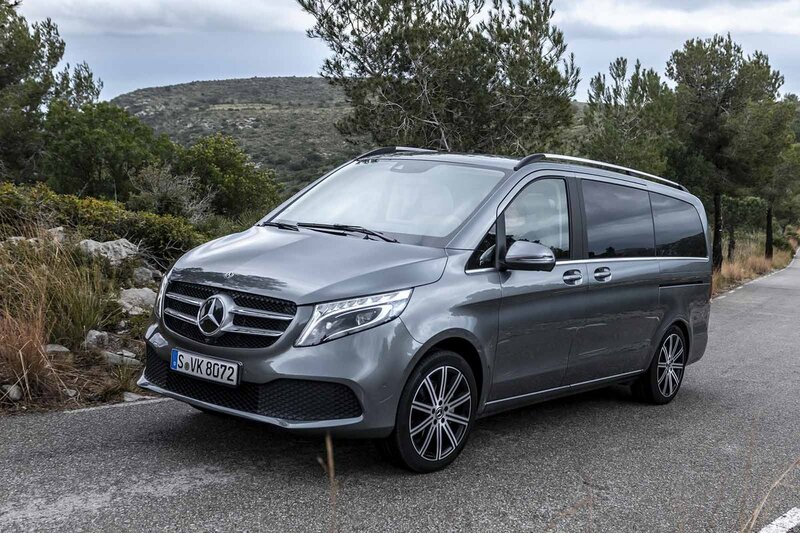 If you go for the longer eight-seat V-Class Long and Extra Long models, the boot is far bigger and will swallow several large suitcases. Meanwhile, the campervan-style V-Class Marco Polo turns that seven-seat interior into luxury property on wheels. There’s seating for four, two of whose seats can fold down into a double bed. For the other two, a pop-up roof provides space for another double bed on the makeshift ‘second-floor’. Depending on specification, there’s also a full-on kitchen installation with a sink, gas hob, fridge and plenty of cupboards and storage compartments. Factor in Mercedes’ trademark glitzy finish and the end result is a living space that is significantly more glamorous than most university halls’ of residence.